One of the high points of King David’s reign was when he brought the ark into Jerusalem. Priests carried the ark into the city of David. Wearing a linen ephod (priestly boxers), David danced and leapt around worshiping with abandon. The people blew the top off the city with shouts, praises, and trumpet blasts. It was a raucous, exuberant tumult. Everyone was acting crazy for the Lord (2 Sam. 6:14-15). Well, almost everyone: “Saul’s daughter, Michal, looked down from the window and saw King David leaping and dancing before the LORD, and she despised him in her heart” (2 Sam. 6:16). Michal looked down on David in every sense, not just from the window. She didn’t compromise her dignity to worship like David and the commoners. 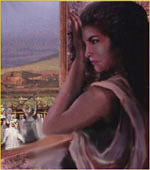 When David got home, she said, “How the king of Israel honored himself today! He exposed himself today in the sight of the slave girls of his subjects like a vulgar person would expose himself” (2 Sam. 6:20). Wow. Acid dripped from Michal’s words and sizzled on the palace rug. If Proverbs 21:9 went through David’s mind he didn’t quote it. He had faced much worse than a sassy wife, and he was done living in the dog house. David replied, “I was dancing before the LORD…. I will celebrate before the LORD, and I will humble myself even more and humiliate myself” (2 Sam. 6:21-22). Michal died without having any children (2 Sam. 6:23). Did the Lord curse her womb? Or did David have no further union with her? Scripture doesn’t say. But it was a direct result of despising her husband and king. There is a moral to this story for the church. Here we have a bride who sees her lord lower and humiliate himself for God, and she refuses to join him. She stands aloof then mocks him for his sacrifice of praise. The result? She can’t have children. The church is the bride of Christ. Our Husband and King humiliated Himself on the cross. Do we stand aloof from His sufferings? When the Lord wants us to lower ourselves in a situation do we abandon Him to keep our dignity? The church that refuses to know His cross will birth nothing of her Husband. The bride that despises His humiliation will bring forth nothing of her King. In Revelation, John’s closing vision is of the New Jerusalem. An angel presents her as “the bride, the wife of the Lamb” (Rev. 21:9). The Lamb is her lamp. The river of life flows from within, where God and the Lamb are enthroned (Rev. 21:23, 22:1). The tree of life—the cross of Christ—continually bears fruit in her (Rev. 22:2; 1 Peter 2:24). This isn’t a vision of the afterlife. It’s a vision of eternal life. There’s a difference. One is a happy future existence. The other is a marriage, a relationship of mutual self-giving. The Bible calls this love. The church exists for this relationship, this marriage to the Lamb. She exists to live in union with Him who laid down His life, to join His undignified selflessness (John 15:13; 1 John 3:16). Genesis 1:27 tells us God created mankind in His image, and created us male and female. God’s first command was given, not to Adam, but to His image: “Be fruitful, multiply, fill the earth, and subdue it” (Gen. 1:28). This verse is pregnant with divine purpose (excuse the pun). It is not about populating the globe. It tells us what God’s vision was from the beginning: that His image fill and subdue all things. Christ is the image of God (Col. 1:15). As the female in this relationship, it is through us that Jesus multiplies, fills creation, and brings it under His rule. We cannot fulfill that purpose while His wounded hands and side offend us. We cannot birth something of our Husband if we despise His very essence as the slaughtered Lamb (Rev. 5:6).